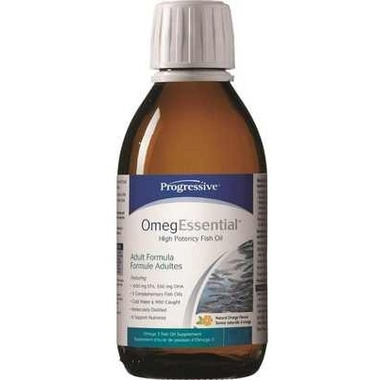 OmegEssential High Potency Fish Oil is a foundational supplement designed to be taken on a daily ongoing basis. It has a long list of benefits including enhancing mental acuity and brain function, and is ideal for the maintenance of good health. Each serving provides 1,000mg of EPA and 550mg of DHA in a balanced 2:1 ratio. It also includes a family of support nutrients designed to naturally enhance your body’s ability to process and utilize the essential fatty acids. Other Non-medicinal Ingredients: Natural Orange Flavour, Stevia Extract. Contains no artificial flavours, colours, sweeteners or preservatives of any kind. *Proportions of the individual fish oils may vary due to seasonal availability and sustainability. Directions (Adults): Take 1 tsp (5 ml) daily with food or as directed by a healthcare practitioner. Tastes great, I feel some memory boost. This is an excellent quality fish oil. The flavouring is good too so it doesn't smell or tastes like fish. The taste isn't bad. You may have slight fishy burps. But they're minimal in comparison to other fish oil pill brands I have tried. Probably the best tasting fish oil out there! I've tried many and was settling on another brand until now. I will be ordering again! The taste is subtle and it's actually good. This is great value for an effective brand. I like the taste of the oil, it's easy to drink, there is not aftertaste or anything unpleasant. If I can only remember to take every day! I really like this oil. Has a great taste considering what it is. Would have given it 5 stars if they provided us with Vitamin D as well like so many other Omega-3 products do but I just supplement it separately. Will buy again.